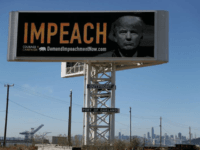 A billboard in California displaying the word “impeach” next to President Trump’s face is still standing despite claims that the billboard had been removed. 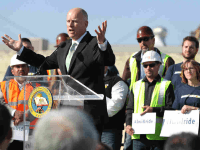 California state officials may betray the promise they made to Southern Californians that the projected $68 billion bullet train’s first completed section would run from Burbank to the Central Valley. The lead designer of the Bay Bridge is warning that the cables holding up the eastern span are vulnerable because of water leaking into the twin steel boxes anchoring them. 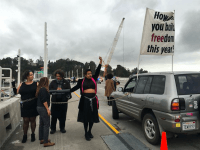 On Thursday, the three-member oversight panel supervising the Bay Bridge construction project voted to punish the chief contractor, American Bridge/Fluor, by withholding $8 million in payments and fining the contractor another $3 million. 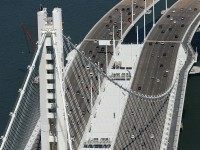 The bad news for the San Francisco Bay Bridge tower just got worse: cracks have been discovered on some of the rods that are part of the tower foundation, according to Caltrans. Caltrans also admitted that one of the four tower anchor rods broke after water exposure made it brittle. 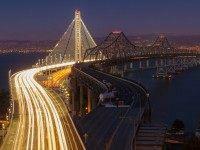 Caltrans director Malcolm Dougherty admitted on Thursday that the sleeves of 120 of the 400 “high-strength” rods anchoring the tower of the new Bay Bridge to its foundation are immersed in salt water that could corrode them. On Wednesday, Caltrans confirmed that one of the 424 25-foot-long steel rods supporting the Bay Bridge eastern span’s tower has fractured. Brian Maroney, Caltrans’ lead bridge engineer on the eastern span project, showed reporters the 3-inch-thick tower rod, asserting that Caltrans didn’t know what had caused it to break and that any reasons given for the break would be “speculative,” according to the San Francisco Chronicle. A steel rod supporting the 525-foot tower atop the eastern span of the Bay Bridge has failed an integrity test, prompting fears that corrosion caused its failure and thus other rods may fail for the same reason, leaving the tower at risk from an earthquake.